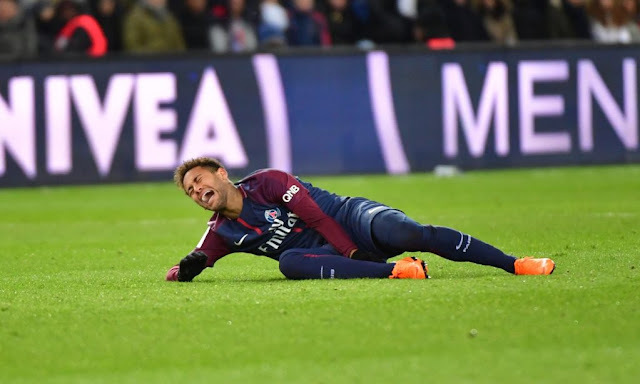 World’s most expensive footballer and PSG star, Neymar, has been ruled out for a month with a foot and ankle injury he sustained in his team’s Ligue 1 win over the weekend. Seeing that Real Madrid visit PSG for the return of their round of 16 match in just 9 days, the highly rated Brazilian attacker is sure to miss the crucial showdown. The Brazilian was a late casualty in Sunday’s Ligue 1 clash with Marseille, in which the French leaders ran out easy 3 – 0 winners. Neymar was left in tears after tangling with Marseille’s Bouna Sarr, with all signs pointing towards a damaged ankle. And while preliminary tests ruled out a fracture or serious sprain in the joint on Sunday evening, subsequent examinations have revealed the full extent of his injury, and that he has also damaged a metatarsal bone in his foot. “Complementary examinations performed today (ultrasound and CT) confirmed an external sprain of the right ankle but also the associated existence of a fracture in the fifth metatarsal,” a statement released by PSG on Monday confirmed. As a result Neymar faces a minimum of one month on the sidelines, and will not be able to take part in PSG’s bid for Champions League revenge against the Blancos.